Barry Schwartz’s homebred La Fuerza (Flatter) collected the third stakes victory of his young career Sunday when Hall of Fame Jockey John Velazquez guided him confidently to a 2 3/4-length victory in Aqueduct’s $100,000 Notebook Stakes for New York-bred juveniles. La Fuerza was the most battle-tested of the six youngsters signed on for the 6-furlong Notebook with six starts already under his belt. He was also the most accomplished of the group. His three wins to date included decisive victories in the Rockville Centre Stakes at Belmont on July 14, which he won by 4 1/2 lengths, and the Aspirant Stakes at Finger Lakes on September 8, which he took by three lengths. In both cases he stalked the pace. La Fuerza’s two most recent starts, however, raised some questions about how he was holding his form. A fairly well-beaten third in the New York Breeders’ Futurity at Finger Lakes, the colt did virtually no running last out in the Sleepy Hollow on the October 20 Empire Showcase Day card. 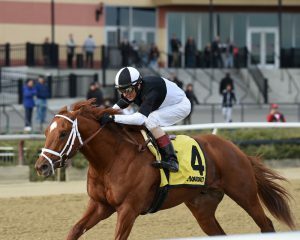 Attracting the bulk of the wagering interest, on the other hand, were two juveniles coming off sharp maiden wins on the Empire Showcase undercard. Kosciuszko aired more than six lengths with a frontrunning score while earning a gaudy 83 Beyer Speed Figure. Thorny Tale graduated handily at first asking with a tracking trip. This pair was co-favored at 8-5, while La Fuerza was let go as the third choice at 4-1. Forwardly-placed after a good start for all, La Fuerza sat just off a duel percolating between Kosciuszko and 46-1 longshot Analyzethisandthat, who was quickest out of the gate. Once Kosciuszko took over the lead solo, La Fuerza advanced to issue a challenge early in the turn. Ridden confidently by Velazquez through the bend with Kosciuszko to his inside and Thorny Tale on the outside, La Fuerza straightened away ready to roll. Meanwhile Analyzethisandthat cornered neatly and rallied into second at the rail. La Fuerza dispatched Kosciuszko, then Analyzethisandthat in upper stretch and kicked clear to secure the victory by 2 3/4 lengths. Analyzethisandthat posted a solid second while Kosciuszko and Thorny Tale finished further back in third and fourth. Completing the order of finish were Bustin Hoffman and Bustin to Be Loved. Following fast early fractions of 22.92 and 47.13, La Fuerza completed six furlongs over the muddy going in 1:12.28. Trainer Todd Pletcher focused on the difference between La Fuerza Sunday and his disappointing tenth-place finish in the Sleepy Hollow, also with Velazquez aboard. 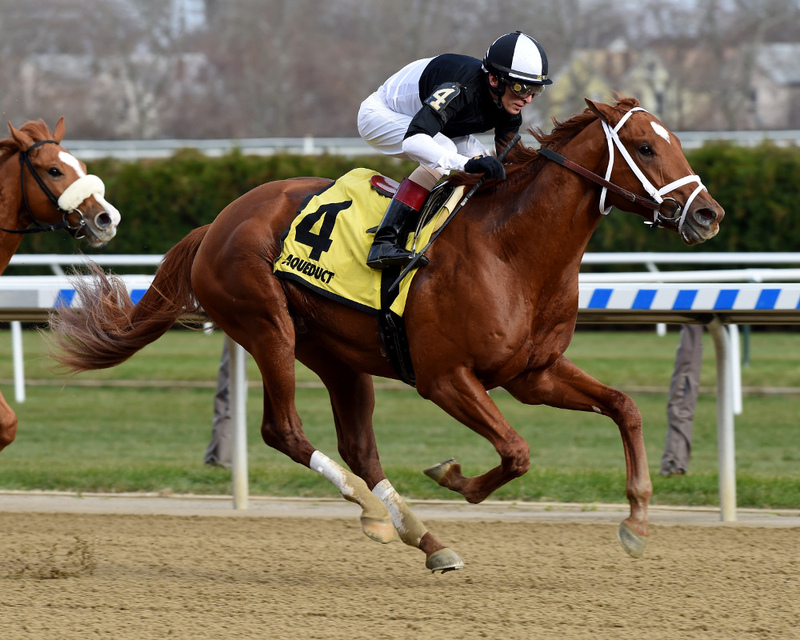 Pletcher plans to keep La Fuerza in New York for the winter in the New York-bred stakes ranks. With a record of four wins and a third in seven starts, all stakes save for his winning debut, on June 22, the chestnut has earned $249,010. Foaled at Barry Schwartz’ Stonewall Farm in Granite Springs, La Fuerza is the first foal out of Jonata, a Kentucky-bred two-time winner by Proud Citizen purchased by Schwartz as a yearling for $100,000 at the 2011 Keeneland September sale. Without issue in 2017, Jonata foaled colt by Mizzen Mast on January 27, 2018 and was bred this year to English Channel. I foaled this one! So proud to see my babies do well. Best of luck and congratulations to Mr. Schwartz! !